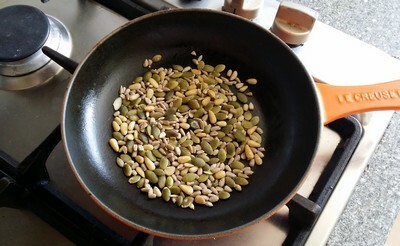 I toasted the pre-soaked pumpkin/sunflower seeds in my cast iron skillet to dry them and release some aroma and essential oils. 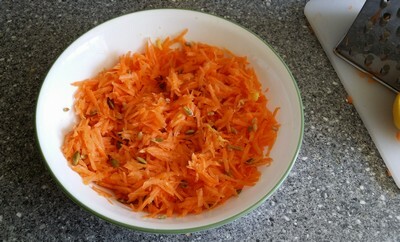 I then let my toasted seeds cool, whilst I peeled and grated my carrots. 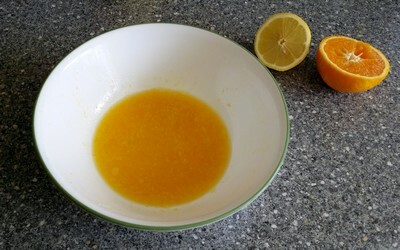 Next I grated the zest from my orange and lemon, juiced the fruits and then added the zest to the orange/lemon juice. 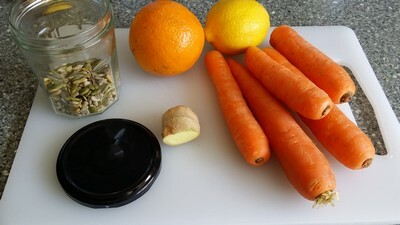 I grated my ginger piece and mixed it into the lemon/orange/zest juice mixture to make a dressing. 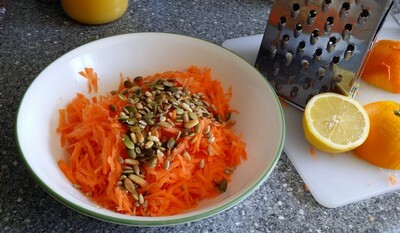 Finally, I mixed the dressing with the grated carrots and then added the toasted seeds. An easy salad to make which may be stored in the fridge for around a week. It combines well with other salads like beetroot, date and fennel salad or dips like hummus and pesto.